Former South Sudan Vice-President Riek Machar has said rebel troops have captured the key oil-producing state of Unity and control much of the country. Mr Machar also confirmed to the BBC that the forces fighting the government were under his command. The country has been in turmoil since President Salva Kiir accused Mr Machar a week ago of attempting a coup. The BBC's former Sudan correspondent James Copnall says the situation now looks very much like civil war. At least 500 people have been killed since the fighting began with the government struggling to keep control of the capital, Juba. UN Secretary-General Ban Ki-moon called on both men to "find a political way out of this crisis". "I demand that all political, military and militia leaders stop hostilities and end the violence against the civilians," he said. "I call on them to do everything in their power to ensure that their followers hear their message loud and clear." Mr Machar's comments to the BBC came as four US service personnel involved in evacuating US citizens were wounded when their aircraft were shot at in Bor, the capital of eastern Jonglei state. The most significant thing is that Riek Machar is confirming what the government had claimed - he is leading this rebellion. The former vice-president is now a serious military rival for President Salva Kiir - after years of political clashes. But how big is Mr Machar's new empire? Residents of Bentiu, the capital of Unity state, say Gen James Koang has announced on local radio that he is in charge - and that he is loyal to Riek Machar. So Mr Machar's claim that his troops have taken Bentiu as well as Bor seems to be true. In addition, a well-connected security source, and a local resident, both say Mr Machar's men have taken at least some of Unity state's oilfields. This is a huge economic blow for the government. However, it would be premature to say Mr Machar controls all of Jonglei and Unity. In addition, the government is clearly trying hard to win Bor back. That means that in the short term the fighting is likely to intensify. US President Barack Obama has warned that "any effort to seize power through the use of military force will result in the end of longstanding support from the United States and the international community", the White House says. He discussed the attack on the aircraft with his national security team and reminded South Sudan's leaders of their responsibility for helping ensure the safety of Americans in the country. World Christian leaders have called for a ceasefire in South Sudan, where the population is mainly animist or Christian. The Vatican and the Archbishop of Canterbury, Justin Welby, issued a joint statement calling for the country's weak and poor to be "spared the trauma of conflict". "Let us not yield to fratricidal tendencies in the name of our ethnic differences (which is what God created us to be)," they said. Mr Machar, whose claim to control Unity could not be independently verified, told the BBC that a senior military commander, Gen James Koang, had gone over to the rebels earlier in the week. However, government forces say Gen Koang defected alone and did not take any troops with him. Mr Machar added that he was prepared to negotiate with the government if politicians arrested this week were released and transferred to a neutral country such as Ethiopia. 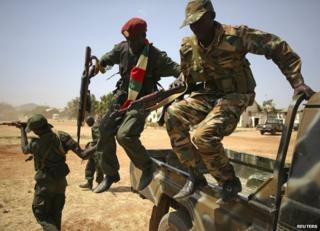 But government troops are currently trying to retake Bor, in one of the most volatile regions in the country. Troops backed by helicopter gunships were advancing on the town, army spokesman Philip Aguer told AFP news agency. A spokesman for UN peacekeepers Unmiss in Bor said considerable numbers of people had arrived over the past 24 hours from surrounding areas seeking their protection. The three aircraft fired on - CV-22 Ospreys - were attacked as they approached Bor, which is occupied by forces loyal to Mr Machar, a US military statement said. All four wounded Americans were treated in Nairobi, Kenya, and were in a stable condition, it added. Our correspondent says Mr Machar's forces were likely to have fired on the aircraft thinking they were Ugandan. Meanwhile Uganda has denied reports that its aircraft are bombing Bor. Uganda is one of a number of countries trying to evacuate their citizens, and has sent troops to take part in the operation. They will also try to secure Juba, just 75km (50 miles) from the Ugandan border, reports say. He said that last Sunday night uniformed personnel opened fire at a meeting of the governing party, the Sudan People's Liberation Movement (SPLM). Violence then broke out in Juba and has since spread across the country, pitting gangs of Nuer and Dinka against each other. Two Indian peacekeepers and at least 11 civilians were killed in an attack on a UN compound in Akobo, Jonglei state, on Thursday. Mr Machar's whereabouts are unknown, though he is thought to be inside the country. Jonglei state has seen some of the worst violence since South Sudan became independent from Sudan in 2011, with hundreds killed in periodic clashes between rival heavily-armed ethnic militias sparked by cattle-rustling.